From 70 megawatts shipped in 2010, Solar Frontier predicts a massive shipment increase in 2011. SAN FRANCISCO --- I interviewed Brooks Herring, the VP of Communications and Operation at Solar Frontier, during the Intersolar show for an update on Solar Frontier's progress. 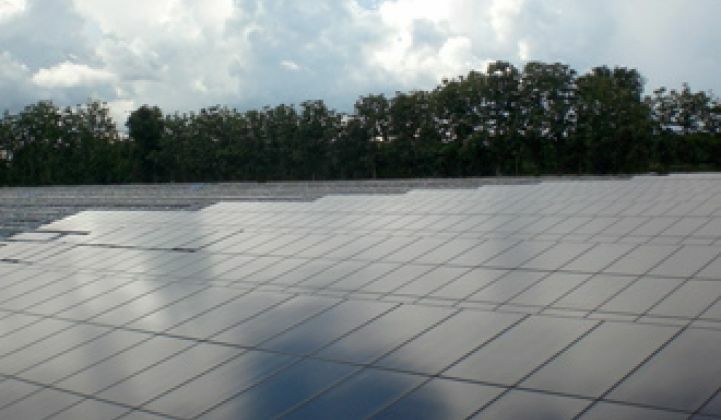 The Japanese CIS thin film firm has started shipping 150-watt modules from its Kunitomi plant. The company also announced that it expects TÜV and UL certification for 155-watt panels in the coming weeks as its gigawatt-scale plant increases performance. Solar Frontier’s monolithic thin-film modules are spec'd at 12.2 percent efficiency, which is a relatively strong number in the thin film world, a bit better than First Solar's 11.6 percent, but still trailing the 14 percent to 22 percent module efficiency of the crystalline silicon vendors. Herring said that the Solar Frontier roadmap has the firm at 13 percent efficiency in 2013 and 14 percent in 2014. The VP would not disclose price-per-watt figures. But here's the breathtaking piece of information: Solar Frontier expects to ship 500 megawatts of solar panels this year. That's up from 46 megawatts in 2009 and 70 megawatts in 2010. It's a formidable increase, and if the firm can meet the goal, they will clearly be the second largest provider of thin-film modules, ranking right behind the two gigawatts that First Solar expects to ship this year. It remains to be seen if Solar Frontier can meet the profit levels that First Solar has achieved over the past years.